This trade requires a little bit of toy-collecting knowledge. Bundling comics with toys is not a new concept; Masters of the Universe toys came with full-length comics years before the cartoon began, while both Toy Biz and Hasbro have sold Marvel toys with reprints. However, Transformers toys have traditionally been connected more to the animated series than the comics. The few mini-comics which have come with the Transformers toys were mediocre at best and cringingly bad at worst, such as the infamous Armada “JaAm” comic. Hasbro is stepping up the toy/comic connection with the current run of Transformers: Spotlight. The first six issues of this new initiative are collected in the Transformers: Dark Prelude trade. Thankfully, Hasbro and IDW haven’t skimped on quality for these toy pack-ins. 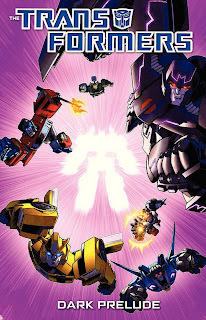 Three stories are written by More Than Meets the Eye’s James Roberts, two are by Robots in Disguise’s John Barber, and the last is written and drawn by Nick Roche, Roberts’s Last Stand of the Wreckers collaborator. This keeps everything strictly aligned with the IDW continuity, and indeed, the Spotlights are used to fill in some narrative gaps. The artists have all worked on Transformers comics before, and the biggest addition is Steve Kurth, a well-known Marvel artist. Kurth’s presence and Phil Jimenez drawing the upcoming Dark Cybertron crossover demonstrate that IDW is getting a knack for securing some of the big names as other publishers alienate them. Roberts and Kurth begin the trade with Spotlight: Orion Pax and featuring a very young Orion Pax -- later Optimus Prime -- before the Great War begins. Many facets of the Transformers franchise keep trying to portray Optimus as more down-to-earth, but Roberts and Barber frame him as the IDW-verse’s Superman. Both his physical feats and his leadership are legendary, as seen in this tale where he, Nightbeat, and Alpha Trion are sent to a dangerous and stormy portion of Cybertron to exchange two defectors for Ratchet. While Alpha Trion was Optimus’ primary advisor in the cartoon, he hasn’t done too much in the IDW universe, but here he gets a great portrayal as a sage who can still take part in a fight. Three of the first four Spotlights—Orion Pax, Thundercracker, and Bumblebee—tell a loosely-connected story about the hunt for Metroplex, one of the great Titans and the possessor of a space bridge which can provide instantaneous transit through the universe. This is a continuation of story points from Robots in Disguise, and as the “Dark Prelude” trade title implies, this hunt has strong implications for “Dark Cybertron.” Thundercracker’s story takes place after Orion Pax’s but before the war as he works with a group of Metroplex hunters. Amongst these hunters, oddly enough, is the new Generation 1 version of the Beast Wars character Waspinator. Other Beast Wars characters have been incorporated into this universe since, and Waspinator lives up to his old role by getting blown up. At the end, Thundercracker establishes his persona as one of the more sane Decepticons by keeping information from his boss, the wicked Bludgeon. The Bumblebee story takes place in the later parts of the old ongoing series as he struggles with leading the Autobots after Optimus leaves for Earth. John Barber uses this opportunity to give Bumblebee some characterization as he gets into a brutal fight with the wild Stunticons. It sets up a lot of the interplay between Bumblebee and Prowl from Robots in Disguise, even if there’s a bit too much monologuing. Sandwiched between the Thundercracker and Bumblebee issues is Spotlight: Megatron by Nick Roche. While it doesn’t add to the Metroplex plot, it does work to link how the Decepticons rose from their defeat in the ongoing and got into their current position. Roche also gives Megatron and Starscream an opportunity to sort out their differences with a dogfight now that Megatron has a new stealth bomber alt-mode (and incidentally, the third-best of the new molds). While the previous four issues are connected more to Robots in Disguise, the final two are firmly part of the More Than Meets The Eye continuity. They take place simultaneously in a gap between issues #5 and #6, with Spotlight: Trailcutter set entirely aboard the Lost Light starship. Trailcutter used to be known as Trailbreaker, but Hasbro lost the rights to use that name for toys. This is hardly a unique experience; Hasbro lost the name “Shockwave” for years, resulting in characters named “Shockblast” until they got the name back. This is, however, one of the rare times that such a name change gets explained in the story, as Trailbreaker upgrades his name and confidence under his new life coach ... Whirl. If you’ve read MTMTE or my reviews of it, you’ll know that Whirl is totally insane, and having him act as Trailcutter’s new mentor is one of the funniest things I’ve read all year. There’s all sorts of great funny bits, such as Trailcutter’s “forcefield face” -- the scrunched-up face he makes while using his powers -- and Rodimus’s penchant for giving away elaborate awards with his face on it. A new squad of Metroplex hunters led by Transformers Animated transplant Lockdown ties this in a bit to the other books, but it mostly gives Trailcutter an opportunity to show off. The Hoist issue, meanwhile, sees him stuck on a planet full of nightmares with a damaged crew. Hoist isn’t the most interesting of characters; the focus is more on Swerve and Sunstreaker. The best part is how it ties into Spotlight: Orion Pax and how it ends with Pax crashing into a shuttle while tied to a rocket. I can’t call Transformers: Dark Prelude essential unless you’re reading RID and MTMTE, but Hasbro and IDW have at least assembled a quality product. The toys may technically be marketed towards adult collectors, but they’re perfectly suitable for kids, working as a response to those who only think that adults buy comics anymore. Hey, I love this site, your blogs, and especially your TF posts. But i just have to point out that this book isn't a reprit of toy pack-ins. These were honest-to-Primus issues. You're right, and I should clarify: as far as I know, the toy designs came first, and then the Spotlights were released at regular retail. Then the Dark Prelude trade was released. Finally, the Spotlights were released packed-in with the toys. Oh, you mean the IDW Classics toys? The comic designs came first, then they made those character designs into toys with the pack-ins comics, then put out the graphic novel. It could have been GN then toys with comics, not sure about that bit.